Can You a Eat Peanut Butter Sandwich as a Meal Replacement for Working Out? Meal replacements are intended to take the place of a full meal, whether it's breakfast, dinner or lunch. A peanut butter sandwich as a meal replacement for working out is an excellent choice because it provides your body with a range of essential nutrients, including carbohydrates, protein, fiber and fats, as well as vitamins and minerals. To maximize your nutrition, choose natural or organic peanut butter and whole-wheat bread that does not contain additives. According to the Peanut Institute, peanuts and peanut butter contain beneficial plant protein that may help to reduce your risks of cardiovascular disease and help to lower your blood pressure. Peanut butter contains relatively little saturated fats and mostly "good" fats, with 51 percent being monounsaturated fats and 33 percent polyunsaturated fats. The amount of trans fat that hydrogenated peanut butter contains is small, but natural and organic peanut butters contain almost none: A little trans fat occurs naturally but is unlikely to affect your health. Peanut butter contains B vitamins, including folate, as well as important minerals such as calcium, iron, magnesium and zinc. 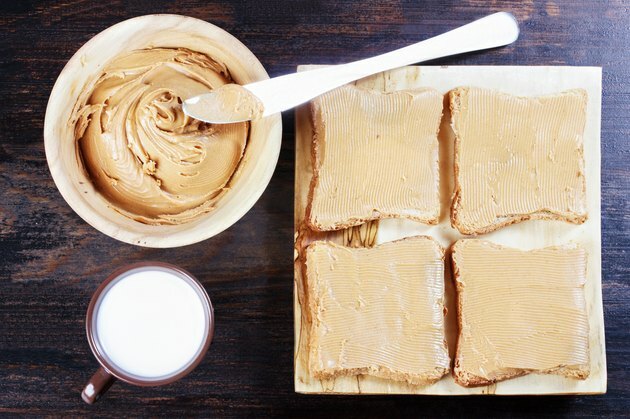 Consuming five tablespoons of peanut butter per week may reduce your risk of type 2 diabetes by 21 percent, says the institute. Peanut butter is relatively high in calories, with approximately 95 to 100 calories per tablespoon, so eating a peanut butter sandwich as a meal replacement will probably provide you with enough calories to power you through a workout. Because peanuts contain plenty of protein, fiber and fats, they contribute to the feeling of fullness after you eat. Combine that with healthy whole-wheat bread and you'll have a nutritious meal replacement that won't leave you feeling hungry. Additionally, peanuts have a low glycemic index of 14, which means that they are absorbed gradually into your bloodstream and thus help keep your blood sugar in balance. The fiber content in peanut butter is modest, at about 1 gram per tablespoon. Combine that with two slices of whole wheat bread, which provides about 2 grams of fiber per slice, and you'll have a sandwich that provides a total of 5 grams of fiber. The University of Wisconsin says that although there is no official recommended daily allowance of fiber, you should consider eating 25 to 35 grams of fiber every day. A peanut butter sandwich on whole wheat bread will provide you with roughly 14 to 25 percent of that fiber. Dietary fiber keeps your digestive system working properly and can reduce your risk of developing digestive-system diseases, including colitis and colon cancer. The bread that you use for your peanut butter sandwich is as important as the filling. Whole-grain products, such as whole-wheat bread, provide better nutrition than bread that's made from bleached white flour. The Wheat Foods Council notes that whole-wheat bread contains more protein than white bread, and the wheat germ it contains provides additional minerals. The exact amounts of protein and other nutrients vary by brand, but you should look for products that list whole wheat as the primary ingredient to get the most nutritional benefit.